The Everyday Value of Dressage. 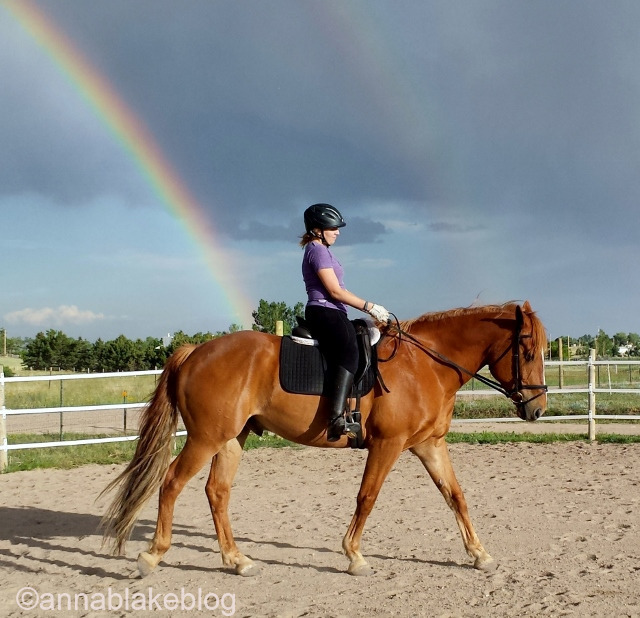 Is your horse a different person under-saddle? Maybe tacking up is all good, but once you are ready to mount, he dances around a bit. But you’re athletic enough to grab on and swing a leg over, pulling on the reins to slow him down. Oh well, then his head comes up, but you’re no pansy. Sure, his trot is jolting and his neck counter-bent, but you can ride him through it. So he’s trotting hollow but you can just pull down and back on the reins to fix it. Now he’s braced as much as you are and the trot is really rough. It’s so uncomfortable to ride, that you move him to the canter. After all, you’re a committed rider, just push through it. And then, because it’s your intention to progress in your riding and not be at Training Level forever, you try a shoulder-in by pulling the inside rein and twisting him to a tense, hoof-dragging crawl. And maybe 45 minutes later, you get a bit of softness. Partly because you are exhausted and fighting less, and he’s taking the cue. You cool him out, give him lots of treats, and the next ride starts the same way. Maybe you don’t notice you’re being adversarial at all. Maybe this kind of riding feels normal or even necessary to you. You know you’re being rougher than you want to be, but your particular horse requires it. It’s just who he is. You’re wrong. Maybe a trainer has told you that there is some dominance fight that you have to win by force, so your horse will respect you. Or some non-sense about not releasing until your horse does. (I am about to be very un-popular.) But they’re wrong, too. You can’t reprimand a horse into happy work anymore than a man can dominate a woman into love. Fear doesn’t inspire horses any more than it does us. If a horse’s walk is tense and not rhythmic, that isn’t going to improve much at the trot. And if the trot is tense and hollow, then to be honest, his intimidated canter will be painful for all involved. The ride you are getting right now is no accident–that’s good news. The two of you can improve, but the rider has to be different before the horse can be. I repeat, you have to change first. But it’s still the New Year and no better time to go back to basics to peel back another layer of understanding. When you see a more advanced rider it just means they have gone back to the beginning more times than you. Not so glamorous when you look at it that way, but nothing else about riding is glamorous, so here we are… all of us at the beginning together. Let’s walk. Dressage training is built on a foundation that says–first and always–a horse must be relaxed and forward. That is square one; as true for Intro Level as Grand Prix. The small print says that we may not sacrifice forward movement for relaxation, and even more challenging, we may not sacrifice supple relaxation for forward movement. This is why Dressage judges have as many words for hollow and tense as Eskimos do for snow. Reminder: We don’t actually ride this way to please judges. We do it for the well-being of the horse. This foundation is my favorite thing about Dressage. It’s a simple, and not at all easy, path to partnership if we persevere and listen. We can’t make a horse relax with a cue like a down-stay. Training relaxation requires a relationship where the language is more evolved than “Me–Tarzan, You–Jane.” This is where I remind you that riding is an art. The secret to success with a horse is not mystical, it’s fundamental. How your horse is moving is always more important than what he is actually doing. It can take a long time to understand this. Riders want race ahead to the party tricks: flying changes or lateral work or piaffe. Those movements require an even more artful balance of relaxed and forward, with a profound and practical embrace of the fundamentals. In other words, go slow. It’s like a pass/fail test. If your horse is tense, everything lacks rhythm and is a fight. But with the freedom of forward movement, balanced with relaxation, training anything gets easy and puts both of you on the same side. The miracle of Dressage is that to do it correctly, we have to evolve beyond domineering control. Ta-da, partners! A horrible generalization: I sometimes think that the reason women compete so successfully in dressage is that we partner with horses naturally, partly because we share an understanding of the down-side of dominance. We don’t enjoy being told what to do either. Just an observation. P.S. I have a book on the way, follow that process at www.annablake.com. And Thank you! ← It's a memoir of coming to Infinity Farm. This is really helpful! I am a new rider. I love this blog! Welcome to the extended herd, thanks for reading. Your horses think the exact same thing…good to have patient humans. I enjoyed reading this so much. So glad I’m getting emails with your blog posts. I think I know what you mean about nothing about horses being glamorous. It can be bloody hard work. I’m typing wearing insulated overalls fresh from cleaning stalls — nothing glamorous there. BUT — the liquid of a horse’s eye, the curves of their necks, their legs, the vista between their ears, the saunter at liberty out into the field — just some stream of consciousness examples why horses are oh so glamorous to this slightly smelly disheveled reader. Great comment, and yes, maybe we are ‘differently glamoured’, but I’m with you! You make me think of dancing. I took ball room dance lessons once and I was sooo disappointed. Didn’t like it at all. Know why? Because in ball room dancing, the man leads and the woman follows. If you step on his foot, it’s your fault. If he steps on your foot, it’s your fault. And the woman doesn’t get to even make a suggestion. Even if she’s a better dancer than her partner. I bet that’s how my horse feels lots of times. It’s also why I try to be a “benevolent dictator” (Josh Lyons term) as a horse owner/rider. I trail ride. Sometimes my horse can pick a better way over a creek or across a log than I can. So I try to listen to him/her. They also often know the way back to camp much better than I do. Many times I’ve sat on a restless horse trying to figure which way to go when I should have just listened to him/her and let them take me back. They knew the whole time I was trying to figure it out. Nice Partnership! Thanks for the great comment. Maybe not a horrible generalization… but simply the truth. Perhaps also an explanation for how easy it is to fall into seeing riding as an adversarial rather than cooperative relationship. Sadly, just a (bad) habit. Thanks. You won’t be surprised that this dominance question, as if it’s a question, comes up in the book… I especially like this comment, thanks. Oh Anna, where were you when I got Woodrow 20 years ago? I knew nothing, and he knew I knew nothing. Our relationship soon devolved into fear (me) and stubbornness (him). My fear was from being bucked off twice. Now, I don’t blame him. Thank Dog we found the perfect home for him. You’re the best, Anna! Diane, quite literally, where I was 20 years ago (okay,more like 30) was getting bucked off my Grandfather Horse, who thought it was a poor bet that I would ever buy a clue. But then, you know what I think about him… I’ll go give him a scratch from you. And thank you for the visit, Eddie.